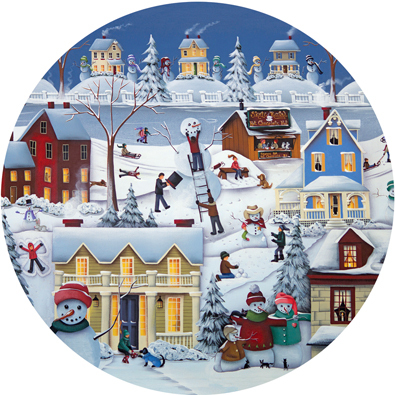 My "Chimney Smoke and Cheery Snowfall" painting is now available as a round puzzle and you can get it at Bits and Pieces website. I'm off to work on a new autumn painting! Love this new cooler weather, but my sinus's not so much. It's difficult to love autumn, my favorite time of year when I suffer with seasonal allergies! It's kind of a love/hate relationship. That is an adorable puzzle! I am dealing with allergies too. Get thee some local honey for those allergies. The sinuses will thank you. Now this is just the sort of puzzle that I love doing where the colors are distinct and clear.